I've been wanting one for a while, so I finally broke down and got one. I think it'll be great to have for events so I can share fun things with everyone (like upcoming book signings and World Fantasy next month). I find it ironic that I can't take a picture of it to show you, but it's tiny and adorable, and brushed metallic pink. Better yet...it matches my laptop perfectly! Oh wait! (Googles the name of her camera)...Here it is! Of course this also means you might be subjected to random photos as I figure out how to use it and how to transfer photos to my computer. Nice. 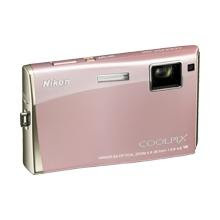 The Coolpix is a great little camera. I work for a photo department and I still don't have a digital camera of my own. Talk about irony! Have fun taking pictures of your book on the shelves! It's beautiful! I love photography also, and I started to become good at it after spending 4 months in Australia (honestly, the country's so gorgeous that the pictures took themselves). Can't wait to see what you take! Thanks! My husband takes beautiful shots, but his camera is way too complicated for me :) Too many buttons!